Thank you for being here today to celebrate the life of Sister Helen. Our monastic community certainly extends our sympathy to Walter, Sister Helen’s brother, her nieces and nephews, and former students and colleagues who have joined us today. If asked to describe Sister Helen Kilzer in one word, I believe many of us would come up with the same word: TEACHER. She was a classroom teacher to many of you gathered here today – whether junior high, high school, or college. For some of us, particularly her sisters in this Benedictine community, she was a teacher by the life she led and the example she was to us. Teaching is a vocation she and I shared and in writing this reflection, I was drawn to Parker Palmer’s book, The Courage to Teach. Early in his book, Palmer states, “Good teaching cannot be reduced to technique; good teaching comes from the identity and integrity of the teacher.” (p. 10) By identity, he means the family, culture, and experiences that make us who we are. Integrity is the relating of the forces in one’s identity in ways that bring wholeness to one’s life. Palmer says that stories are the best way to portray the realities of the intersection of identity and integrity and I know many of you could tell us stories about Sister Helen and her teaching. I will try my best to do that now. Sister Helen was the seventh of twelve children in her family. I borrowed some of Sister Helen’s own words in describing her family. These quotes come from a vocation poster used at the University of Mary: “Home was where I gradually absorbed the values that have in some way undergirded every subsequent decision I have made: a sense of justice; honesty from a Dad who wouldn’t take a nickel that wasn’t his in more than 60 years of selling Ford cars; thrift but not miserliness from a Mom whose patches were honorable; interest in the whole world from our after-dinner family discussions; and love of each other after the fray of battle subsided and we lingered over Mom’s desserts telling and retelling family stories.” Family was important to Sister Helen. She shared stories with us over the years, traveled to visit family members, and had many family members come here to visit her. Teaching was certainly Sister Helen’s vocation and her passion for learning was palpable to her students. One student explained it in this way: “Sister Helen made us believe that what we were doing was important, significant in some way which perhaps we had yet to discover. This importance was real to us because, looking back on it now, I think we sensed in her a fellow student.” As a teacher, Sister Helen challenged her students. English was not spoken in her foreign language classrooms. She created experiences that engaged her students in the language. I didn’t know Sister Helen during the height of her teaching career, but I observed habits and interests in her later years that obviously took root in her life earlier. She was always reading – books, magazines, newspapers. Dinner time at the monastery fell right at the same time as the BBC World News and the PBS News Hour, so she recorded them on our VCR each and every night so she could watch them later and keep current with what was happening across the globe. 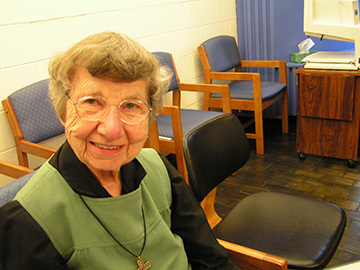 Sister Helen’s life as a Benedictine Sister was as important as her life as a teacher. Sister Helen was a founding member of Annunciation Monastery and lived the Benedictine life for nearly 77 years. She lived her life in community in much the same way she taught – with passion and love. Sister Helen inspired us by word and example. For a number of years, I lived with Sister Helen as part of a smaller community at Scholastica Convent, our former monastery. In her mid to upper 80s, Sister Helen learned how to make muffins so she could take her turn as breakfast cook. She loaded and emptied the dishwasher daily. It was during this time she also wrote a history of the early years of our Benedictine community. In her final years here at the monastery, she set the table for dinner. Serving others was always important to Sister Helen. I want to close with a last quote from Parker Palmer. I believe it describes Sister Helen and the teacher she was to so many students. Well done, good and faithful servant, Helen. Thank you for sharing your heart with us. We are grateful for the gift you have been to us. May you now share in the glory of God with the saints in heaven. Parker J. Palmer, The Courage to Teach (San Francisco, Jossey-Bass, 1998).